From this article, you can learn all the fresh data that will make you the most up-to-date merchant of your market. The only way you will be a successful online merchant is getting to know your market first. You may think your numbers are great, but if you have nothing to compare them to, you really have no idea. You may think your business is innovative, meanwhile, your competitors can be years ahead of you just because they pay attention to market trends. We are going to show you how mobile fares compared to desktop, why potential buyers are abandoning your carts and you will also learn what your competition is planning in the coming years. This article will help you learn all the important KPIs in e-commerce and gain a basis of comparison for what you are doing. You will know precisely where you are falling behind – and I can guarantee you, there are areas where you are. And you will also learn how you can strengthen your business to become a market leader in a few months. The data mostly originates from the US market. This is simply because we have the most comprehensive data sets available here, the most advanced and competitive online market. If a trend emerges in US eCommerce, you can count on it becoming a global trend in months. Innovation is integrated here first and customer habits can be more easily identified because of the relatively high penetration of cutting-edge technology. This also means that eCommerce businesses based in Asia or Europe who pay attention to US trends (and prepare themselves in accordance) can leave their competition standing. They can work on innovative sales methods while their competitors are still trying to understand the changes which occurred years ago. They can become early adopters – technology may be developing in an alarmingly fast rate for years, yet online merchants are still struggling to switch into the right gear. This is true for SMBs and multinational corporations alike as the numbers will undeniably show you. Let’s stop here for a minute and have a look at how development on the global eCommerce market takes place. Forrester Research states that there are three clearly distinguishable groups which we can fit countries into globally. Let’s start our analysis by having a look at how the global e-commerce market is performing lately. The market is changing both in the US and globally. More and more people are shopping online regularly - which means that you have to pay even more attention because they require even more things from you before they are willing to give you money. Looking at these numbers you may think: on a market like this how can there be still room for fresh starters, innovation? What is it that has not been tried, tested and implemented yet? Where is market saturation still low? Either you are a sales manager of a large corporation or a brick-and-mortar merchant, you don’t need to worry. Even the Harvard Business Review thinks that our world is in a state of change, and growing numbers indicate only that commerce is moving online in a faster rate – but you can still very much carve out a slice of the cake. You don’t have to worry about these huge numbers. In fact what you should take away from them is that right now your best option is to join the trends and seek leadership. 51% of US consumers prefers to purchase goods online. 96% of them purchased something online at least once before – 80% in the last month. And despite the 23% year-on-year market growth, small and medium-sized businesses are still falling behind trends: 46% doesn’t even have a website. Thus if you decide to do eCommerce professionally, this itself provides a tremendous advantage. The number of online purchases grows 8-10% every year, however, average order value grows only 1% – another area where you can get ahead of competitors. According to the Econsultancy Ecommerce Performance 2018 report, 78% of both agencies and businesses reported that eCommerce turnover has been growing on their clients’ side, and only 9% reported the decrease. Currently, around 40% of manufacturers have e-commerce websites according to B2BNews. 69% of those who don’t have one plan to launch it in the next 2 years (55% in a year and 34% in the next 6 months). The main reason for manufacturers to realize the importance of e-commerce and starting their great migration of sales to the web is that they can achieve much higher numbers in sales. This is evidenced by the report, 71% of responders choosing this as their #1 reason. Still, many manufacturers view online migration primarily as a way of survival: while their sales decrease at reseller networks, online they can offer what they produce directly to customers, opening up new and cost-effective B2C channels. Purchasing via self-service is becoming more and more popular. Customers go through 57% of a typical customer journey before they want to talk to a representative of the wholesaler. This means that traditional sales methods need to change. Marketing and eCommerce have practically taken over the role of sales in the first stages of convincing a buyer, even in B2B the role of sales mostly focuses on closing deals. Note: While your customers demand simplicity, this can cause you quite a headache – because you have to be prepared for everything. The high volume itself complicates the entire process, but as the number of potential customers is fewer and if you loose one, you loose a deal with much higher value you must shoot for the highest closing rate possible. Thus in the e-commerce system, you create you will need much more than a few integrated payment solutions, a simple cart and inventory management software. You have to be able to make complex transactions and pay attention that your customers have as much payment options as possible. You have to track who gets what kind of unique offer, where should automation transfer the sales process to human hands. You must pay attention to detail: more information on invoices, more details about the products, shipment, even about the manufacturing process and so on. In B2B the power of information is even larger. Your website must be capable of exchanging information with different e-commerce systems. For example, a customer should be able to make the purchase on your website while the system transfers the information to one of your resellers who complete the order, which in itself can be a technical challenge. And we haven’t even talked about inventory, customer relationship management and about how not only your customers but also partners and employees must be able to handle the whole system with ease. To wrap it up, this means one thing above all: you are going to need a dedicated developer team and eCommerce software, otherwise, you shouldn’t even start. It would be hard to know if your numbers are good or bad by just looking at the global benchmarks: a florist and a jeweler may experience very different trends while looking at their respective industries. SO that is exactly what we are now going to do. It may be interesting to compare how much of all customers say they would rather purchase online and what percentage of overall turnover is generated through online sales. It may be interesting to find some explanations where the rates highly different. If the number of online buyers remains low but online sales generates more profit consumers may purchase more frequently or have a higher average order value. If the opposite is true, they may prefer to purchase products of higher value in person. If you want your sales to be effective, you need to know the underlying explanations. You have to do your research on your own market. This is how you can build campaigns, write effective sales copy, product descriptions and emails. Where does your traffic come from? We know the answer and we also know that no one will ever know the definite answer... Let's clear that up and have a look at search engines, devices and the changing habits of your audience. Google is king – but for how long? Google remains the engine of e-commerce, but its dominance seems to be fading a little. It still generated 62% of all traffic and 53% of all sales of e-commerce in 2017, however, the same was 69% and 67% respectively in 2016. In absolute terms, this still counts as growth, but their market share noticeably declined. Meanwhile, the importance of ‘dark traffic’ grew – we can interpret this as the expansion of social media, learn more about this by reading the info we put in the box below. According to statistics we still trust Google: Forbes concludes that it is viewed as the second most reliable brand globally and Moz agrees. Research says the more organic traffic you receive from Google the higher rate of conversion you can expect. The explanation is likely simple: as we trust Google, we also trust the sites its algorithm ranks at the top of result pages (SERPs). A breakdown of dark social and dark traffic: The above expressions basically mean the traffic sources analytics software cannot identify reliably and most of the time treats as direct traffic. Traffic originating from Facebook Messenger from example can be ‘dark’. If you share a link with your friend about a product and they click on it and purchase (and assuming it has no campaign parameters built in), the source remains unknown to analytics. The chance they typed in the address with their keyboard is extremely low, still, it will show up as direct traffic as Google cannot see behind personal messaging. Therefore you should keep an eye on direct traffic and which of your pages have the most of it – they are the most likely to be shared via messaging or in groups and even email. According to surveys 93% of users regularly use dark social to share content with their friends. 32% of users share content exclusively using dark social sources. By itself, this doesn’t mean a lot when you have to choose your ideal channel, particularly because you have to pay attention to the habits of your target audience. It is certain that the first four on this list generate smaller traffic, therefore brings a smaller number of potential consumers to your site. But it may be useful to have these numbers in your mind if your segment is special in some way. Expenses are also excluded as a factor in the above list – it only focuses on conversion rate. And now let’s have a look at how mobile e-commerce is doing. Is it still lagging behind desktop? Naturally mobile grew even more important: 2017 became the first year when overall mobile traffic (52%) exceeded desktop (36%) and tablet (12%) combined. However, 61% of sales can still be attributed to desktop. And desktop users are 164% more likely to convert than those using mobile. According to Momentate Ecommerce Quarterly average global conversion rate was 2.48% as of December 2017. In previous quarters it came in around 2.5-3%. Mobile generated lower numbers: while desktop conversion rate was 3.63%, mobile generated only 1.25%. Tablet follows desktop closely with 3.14%. Research by Adobe shows similar numbers: they concluded that in the second half of 2017 average desktop conversion rate was 3.9%, mobile 1.4% and tablet 2.7%. While conversion rates are hectic, we can see that there is a slow but certain growth. Why are mobile conversion rates lower? Note: Reasons may greatly vary but research gives us some ground to pinpoint the most important ones. Most often users don’t convert on mobile because of poorly optimized, difficult-to-use websites, too complex check-out processes and slow loading speeds. These can all cause a buyer to decide making a purchase in a more comfortable way: sitting behind a desk. Data by Moz indicates that websites which register more traffic originating from mobile or tablet devices were able to grow their profit much faster. Numbers of mobile e-commerce are getting better, albeit slowly. It is apparent that users arriving from a mobile device generate a conversion rate half-quarter as large as those arriving from the desktop. If the conversion rate in your webshop is worse, you likely have some kind of problem with your mobile-optimized sales. However, conversion rates compared to each other between devices did not change significantly year-on-year despite many online stores focusing on optimizing UX on mobile. This indicates that while we are eager to browse products on mobile, consumers still stick to their habit of making the purchase on a computer. BazaarVoice research shows that the volume of traffic originating from mobile devices grew 20% year-on-year for e-commerce websites. Moreover, more than 50% of traffic is generated on mobile. Pew Research Center has also published some interesting data: more than 62% of consumers making a purchase at a brick-and-mortar store won’t do so without taking out their mobile first and checking online reviews of the product in question. Speed is an exceptionally important factor. 2 second is still optimal (read: acceptable) loading speed in the case of any website, Still, eCommerce site loading speed averages at 6.11 seconds. Pro tip: Site speed and turnovers shows and incredibly strong inverse correlation. The faster your site is, the more profit it is going to generate. If you are able to decrease loading speed by just 1.6 seconds, you can increase profit by 10%. Pingdom recently published research on the loading speeds of the 100 largest eCommerce website globally. It is apparent from the data how important speed is: their loading time is merely a third of the global overall average, 2.67 seconds. Bounce rate is also very closely tied to loading speed: between 2 and 3 seconds, it starts to rise sharply and reaching 6 seconds it is over 50%. Also, the largest eCommerce sites also follow best practices in the case of page size: the size of an average page is no more than 3.03 MB. When desktop was dominating, developers still tried to follow the golden rule of 3s: any site should be able to load in 3 seconds and shouldn’t be larger in size than 3 MB. With the rise of mobile, this became all the more important. Just think about the concept of micro moments coined by Google in 2015: we regularly browse for products and even purchase them while on the underground, waiting for our kid in front of the school or standing before a shelf in the store. These are situations when we spend mere seconds with browsing – we have no time for more, not like when we are sitting at the office or at home at a computer. A site that loads a few seconds slower will undoubtedly loose an extremely high amount of visitors. They simply go back to the result page of Google where they came from and click on the next relevant result. They bounce. If you can, use an app: the speed of an app is much more dependent on the type of mobile users than on the internet connection. An app should only refresh data, which is much faster than loading an entire site. Of course, your audience to target will be smaller and mostly consist of your engaged customers. You can read in detail about this in our previous article. The average conversion rate for e-commerce websites was 1.6% in 2017. Average order value per purchase was $139. As always, the performance of the travel market remained outstanding at an average conversion of 2.49% and average order value of $392. Websites offering food delivery were even more successful, generating a conversion rate 15 times higher than retail sites. Which is of course not particularly shocking, given that we usually visit these sites with a strong intention of purchase. The question is mostly what do we order, not is we order at all because we are hungry. The strongest correlation can be seen (according to Moz) in the case of time spent on a site: the more time a user spends on a site the more likely it is they will make a purchase. If you can increase the time users spend on your website by 16% your conversion rate can increase by 10%. How your potential customer decides can depend greatly on how old they are, where they live and even if they are parents or not. Possibly the most important aspect is age. Millennials were born into the age of ecommerce and online shopping, while Baby Boomers had to get familiar and trusting with the entire concept. It is not surprising this shows in the numbers. 67% of millennials prefer purchasing online rather than in a brick-and-mortar store, which is no surprise. But even 56% of Baby Boomers would rather spend money on a website than in person. According to statistics those who have children not only spend more of their budget on online purchases compared to those without children (40% vs. 34%), they also spend more time on shopping online (7 hours vs. 4 hours). Important: American parents spend 61% more online and 49% say they couldn’t live without online shopping. In the last year, men spent 28% more online than women – which can indicate that you can forget stereotypes. But if you are a professional online merchant, you have been paying more attention to data anyway. Important: However both genders spent approximately 5 hours with online shopping per week. Those who live in cities spend the most. They are followed by those who live in the suburbs, than those in the countryside. Customers in suburbs are mostly concerned about shipping fees, however, customers in the countryside care mostly about the security of their data. They all prefer larger reseller sites than online marketplaces and independent webshops and product specific sites. Speed and price of delivery. Seniors care less about discount offers (47%) than other generations. A quarter of online customers are influenced by social media when making a purchase decision. 42% are influenced by the opinions of their family and friends, which is around double of the approximated efficiency of advertisements. Interestingly younger generations seem to be most influenced by ads: 27% say they are influenced by them while only 14% of older respondents say the same. Most online shoppers prefer if the products are presented to them with high-resolution images (78%) and videos (69%). Statistics by Moz indicate that email marketing can still bring in 3X as much revenue as Facebook. Also, those who gain their traffic from email register an overall higher average order value. Cart abandonment emails have an open rate of 45%. Click-through rate is 21%, meaning almost every second opened email results in a click. More than half of those who click through make a purchase. These are extremely high numbers. Cart abandonment emails are one of the strongest weapons in your arsenal that will help you recover a large part of potentially lost revenue. The average global open rate is 24.88%. Average total click-through rate is 4.06%. The average click-to-open rate is 16.31%. These numbers are not surprising at all. Many experts estimate that by the end of the decade abandonment rates could reach 90% – which means a huge opportunity for those willing and capable to fight abandonment. (60%) Too high / unexpected costs at the end of the check-out process. (37%) Signup required for making a purchase. (28%) Too long or complicated check-out process. (23%) Can’t see total cost before starting the check-out process. (19%) Won’t trust the website with their credit card information. (18%) Too slow shipment process. (11%) Website has no guarantees or they simply don’t like them. (8%) Not enough payment options on website. Pro tip: As you can see, most of these problems can be handled quite easily. Shorten your check-out process, test you website constantly (particularly on mobile), make signup optional if you can and only ask for vital information – this way you can still reach out later. In Western Europe, digital payment and credit cards are the leading options. Most customers won’t purchase anything from a site that is not in their native language or doesn’t display prices in their own currency. 75% would like to purchase from sites where they can read about the products in their own language. 59% rarely or never purchases anything from a site that is exclusively in English. 67% prefers to read content and navigation in their own language. 2% would like to make a purchase on sites where they can see their own currency. 33% will likely abandon their cart if the price is displayed only in US dollars. In the US every three in four customers would prefer same day delivery above all other options, even if this means the price is a little higher. This, of course, can lead to challenges in logistics and is basically impossible for smaller businesses operating internationally. However, it shows important it is to ship as fast as possible. Three out of four would like to receive the product on the day they ordered it. Two out of three would like to receive the product in a few hours after putting in the order. One out of three would even pay more if that means shipping is faster. This data, of course, means that giants like Amazon are more likely to please the customers as for them logistics mean a cornerstone of business and innovation. Subscription boxes are a rapidly growing area in e-commerce and they are more and more popular with customers. Between 2013 and 2016 turnover for sites offering this kind of service grew by 3000% and in March 2016 more than 2000 sites offering subscription boxes operated just in the US. The subscription model is one that is also a viable solution for service providers: Banish for example gained an additional $3 million in revenue by implementing it. Just by telling you the statistics it is unlikely we would be of great help - so let us share a few tactics with you that are still very much reliable and can help you increase your traffic and conversion rates. On this list, you will find 8 tools that you can start using in your online store right away, no matter what market are you on. Of course, there are many more, but we want to write about some of them in greater detail. For example on content research & development, you can read this guide we prepared. Median ROI for email marketing is 122% – more than 4 times than other solutions including social media and targeted advertisements on search engine result pages. 89% of marketers say that their most effective lead generation tool is email. 21% of all sent emails get opened in the first hour. Optimization, however, is key: emails that are no mobile friendly get deleted instantly by the majority (80.3%). Properly segmenting your email campaigns can increase your revenue by 760% according to experts. 51% thinks segmenting your email list is the best way to approach personalization. The most effective types of email are cart abandonment and welcome emails (triggering the most action), and trigger-based emails (having 8X the open rate and much higher resulting revenue than traditional sales emails). 60% of consumers say they have been influenced by social posts or reviews on blogs while shopping online. We also know that a consumer is 71% more likely to make a purchase if they see the brand or product in social media posts. 70% of millennials say their intent of purchase was affected by their peers or influencers who they follow on social platforms. Businesses can increase intent of purchase by 2.5X by actively using Twitter. Combined with tweets from influencers this can be 5.2X. 86% or marketers have already tried running influencer campaigns, and 92% thinks they are effective. 4-56.7% say coupon offers are very important for them. 4-32.5 % consider them important. 5-20.1% consider them somewhat important. Only 5% said that coupons are less or not at all important for them while shopping in all age groups. Customers shopping with coupons spend 24% more compared to the average consumer. 97% will consciously look for coupon offers while shopping, and in the last year 92% of customers have taken a coupon offer. 42% of loyal, returning customers like to take targeted offers – in the case of new customers the proportion is only 27%. You can also improve customer experience with them: 40% of customers will fell smarter when finding and taking special offers. 78% of customers prefers to get advantages and gifts as part of loyalty programs online because they want to use them faster. 65% of your customers view rewards and gifts as if you were giving them money. 75% of consumers prefers businesses and brands that offer different kinds of rewards. And they show their appreciation: members of loyalty programs spend 37% more on average. According to Forrester Research simply by placing relevant product offers on your pages you can increase your revenue by 30%. Do you know how Amazon grew so large? In 2006 they said 35% of their revenue came directly from cross- and upsell methods. If you show relevant products to your customer that is just a little more expensive than what they are browsing at the moment, they are 20X more likely to make a purchase right away than if you offered a similarly priced product. If you show them an offer that is obviously a worse deal you make it easier for them to make a decision – 78% of your customers consciously evaluate which is the best deal for them, so you can convince them right then and there. Click-through rate of display advertisements is not higher than 0.07% – but retargeted advertisements have a 0.7% CTR according to Business2Community. 70% of retargeted customers are more likely to make a purchase. Conversion rates can be increased by 147% if you retarget wisely. You can increase searches for your brand by 1046% by retargeting. It is also a great tool against cart abandonment: an estimated 26% of customers return and finish their check-out process after being retargeted. According to Barilliance e-commerce businesses gain 31% of their revenue directly from personalized offers. Personalized emails have a 30% higher open rate than those not containing any kind of personalization. Also, the average order value of purchases originating from a personalized email can be 6X higher. Customer experience can also be improved with it, by 56% according to Adestra. 80% of customers prefer if the sites they use give them personalized offers based on their previous purchases. To summarize all of this: 94% of marketers and customers think personalization is important or very important as a factor in customer experience. According to research by LivePerson 67% of customers have used chatbots as a means of customer support in 2017. They ask questions, browse and even make purchases. The whole process can be sped up, you can cut back on live workforce and gain conversion and revenue for practically free. The best email marketing campaigns have open rates around 30-40%. In comparison, a chatbot can easily generate open rates of 80%, but you don’t need to break a sweat to achieve 90%. A CTR of 50% is also a pretty common number. 89% of customers prefer to get information from brands using chatbots instead of browsing their websites and searching for it themselves. First, you need a reality check on what your overall strategy looks like. You could think you are far behind anyone else and still be the best just because your competitors lack the will to be even a little bit innovative. Are you falling behind with your strategy? If you think you have no chance of catching up with your competitors without a complex, comprehensive eCommerce system, you are likely overestimating your market. This is no reason however to rest: it should motivate you to leverage the most innovative solutions possible and become the leader of that market. Only 11% of businesses think their strategy is advanced, documented and lays down the main path for more than 12 months. 43% thinks their strategy is advanced, but it is not implemented efficiently. 40% thinks their strategy is not advanced – it is existing but has little effect on customer experience. 6% thinks their strategy is not advanced at all or admits they have none. 55% somewhat, 14% don’t understand at all what usability factors may have an influence on conversion rates. 59% somewhat understands, 11% doesn’t understand at all what types of content can be used to convince customers to make a purchase. 62 somewhat understands, 10% doesn’t understand at all what exactly convinces their customers to convert. 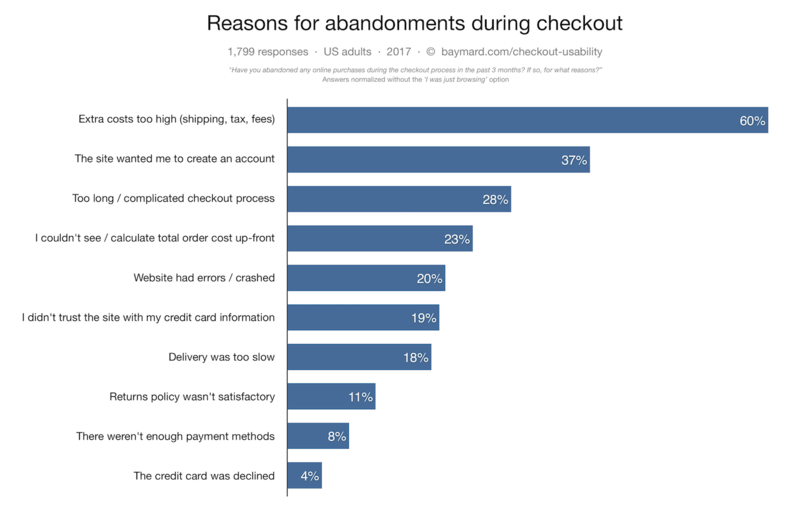 62% somewhat understands, 20% doesn’t understand at all why their customers abandon their carts. 67% somewhat understands, 18% doesn’t understand at all why their visitors leave their site without making a purchase. If you are prepared enough to have the slightest idea about your own processes and track your analytics, if you can answer the most basic questions about your own processes – well, you are already amongst the best. The key to your development is experimenting. And you are in luck again: you won’t have a problem catching up. 81% of e-commerce businesses work based on customer feedback. Only 53% runs usability test. Even fewer, only 30% test their sites by bringing in professionals. Other efficiency-improving tools are only used by 5%. Editor note: What is beacon? iBeacon is a technology standard introduced by Apple in 2013. It basically allows applications to determine location on a micro level and deliver content to the customers based on that data. With it local businesses can reach out to their nearby potential audience with advertisements or valuable content. To summarize it all: emarketers are eager to catch up with technological advancement that is also shaping customer behaviors irreversibly. More and more marketers realize the potential of ecommerce based on conversation, particularly in the case of chatbots. The largest brands in the world are all using them from Uber to Pizza Hut, and recent concerns about Facebook’s privacy issues are unlikely to halt development. More and more discover AI too, which can help eMarketers best in personalization. As competition is ever-growing and businesses are eager to give the best possible user and customer experience, the role of personalization grew huge (see the statistics above). Machine learning can give you an opportunity to target your customers with relevant and valuable content in precisely the right time in a manner simple automation would not be sufficient for. Only the largest companies can allow themselves the luxury of tracking and analyzing every simple KPI with teams of data miners and marketers – and most of the times they can’t even be sure this is good for them. A good marketer can pinpoint the trends they can use in their own market, for their own target audience and therefore those that can lift them from the grey crowd of competing businesses. If you sell something with great value and uniqueness you don’t have to focus on increasing your average order value – and old-timer car merchant won’t focus on selling two or three cars at once. They want to close the most deals possible with a limited inventory and the best-personalized offers. Note: You may not be able to grow your audience further. But from the statistics you may see that they are interested in joining loyalty programs, using applications and therefore you can increase their lifetime value and engagement towards your brand. I recommend you find trends like these: pinpoint where you can’t really make a difference based on your own stats than find the points where you can achieve growth. Track only a handful but significant KPIs at once and don’t seek to follow every new trend. As a small or medium-sized business, you don’t have to invest in AR, VR, apps or virtual assistants – it might be a perfect first step for you to simply launch a chatbot. Take small steps but always take them following trends and your very own data, setting goals which can be tracked, measured and quantified.